In Iran, no matter who you are, a street vendor, a day labourer, a lawyer, or a university professor, one day of politics will take care of you. No matter how careful you are and respect the system scrupulously in public or in private. The fate of one man hangs in mid-air: Kaveh Madani, a respected reader on environmental issues and water science at Imperial College, London. In September 2017, he was invited to become the Deputy Head of Iran’s Department of the Environment under president Rouhani’s government. He accepted and left London for Tehran. In the wake of the inquisition and the crackdown on the environmentalists, he was arrested in Tehran, then released under surveillance, for now…Kaveh Madani’s career in the Islamic Republic of Iran is in balance. In the autumn of 2017, we wrote long papers on water-shortage and environmental pollution. We read some of the papers written by Kaveh Madani on the Iranian bankrupt water system. After forty years of experiencing the Islamic Republic of Iran, its airs and graces, we did not believe, not even for a second, that he would last long enough in the regime to make a change. We wrote, enigmatically and without any reference, a pessimist is an optimist with experience. It was an allusion to our view on K. Madani’s career in the Iranian regime. It is forty years since Iranians with a solid academic education allowed themselves to be deceived by the siren songs of a cruel regime. Many were not prominent public figures. They were driven by enthusiasm, and the need to be useful and act meaningfully in their chosen career in Iran. We saw them returning to the West, disillusioned, discouraged, bitter, and sardonic to various degrees. An Iranian established and working in the country of his Danish wife, left Europe for Iran to “to serve his country and his fellow citizens”. His stay in Iran was cut short. It was on foot and with the help of Kurdish smugglers to help him cross the Iranian borders that he returned home sheepishly to his wife. 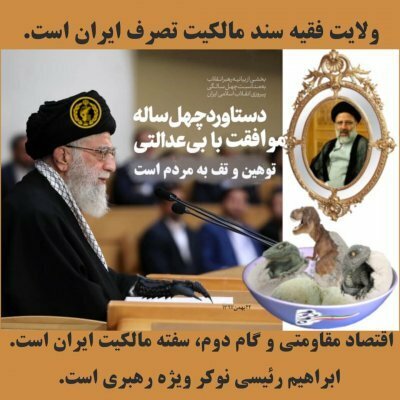 The Islamic Revolution did not allow his offer of service. But then, what is the experience of an old hen worth to the younger generation, even if they care to listen, but choose not to hear? Lately, we have read the blog of Firouz Farzan on Iranwire website. It provides refreshing views on the Iranian mentality. He holds a mirror for us to see ourselves, as Iranians, in it. However, how many are willing to ponder on the images reflected in that mirror? Not many, wherever they are, in the country or abroad. What keep the theocracy in power are the people with a lazy mind living in hypocrisy: The Yes Men and Women. Nothing will change unless we try to reach these people who march in the street-shows, holding banners that read: We obey the orders from the Leader. Till then, whatever is written reaches only a few people, and gets buried in the midst of denying the realities and the wearing of rose-tinted glasses when it comes to considering Iranian politics. No matter what they think, the Iranians follow the Leader in their daily routines. There is not much difference between the one who keeps silent, and the one who marches sheepishly in the street-shows. As Firouz Farzani concluded in a paper: defeating ignorance and despotism requires perseverance and courage. Think about what we have and how the dreamed changes could become realities. Or … would you prefer to live in a country ruled by fascistic methods and tinted with the desires of colonialism, that is, a military theocracy? … A regime that spends colossal amounts on proxy wars abroad and invests little in domestic matters for the future of its young population. The portrait of the Islamic Republic is appalling, bleak and desolate. The changes, genuine and profound, must be shaped in the country, but the politically weak and marginal Iranian diaspora should find the collective ways to assist and accompany them with lucidity.